It started in a hospital waiting room. The doctor was stuck in some emergency and the receptionist told us it will take about an hour. I was flipping through my phone and found this geometrical rendition of a person saying Namaste that I had clicked at Seva Cafe. I started making it on a blank sheet that I had. Somewhere in the middle of the drawing, my neighbor became very interested in the sketch and kept looking at its progress all the while :). When I finished the sketch, I wrote a message on the sketch and gifted it to him. The look on his face was that of utter surprise! He said “You just spent almost half hour on making this, how can you give it to me? You don’t even know me!”. My response was just that “I felt you would like it more than my file!” He couldn’t stop thanking me. And I took his smile back with me. The feeling was so awesome that I made it a regular activity to draw that sketch whenever I was in a waiting area and gift to a stranger nearby. 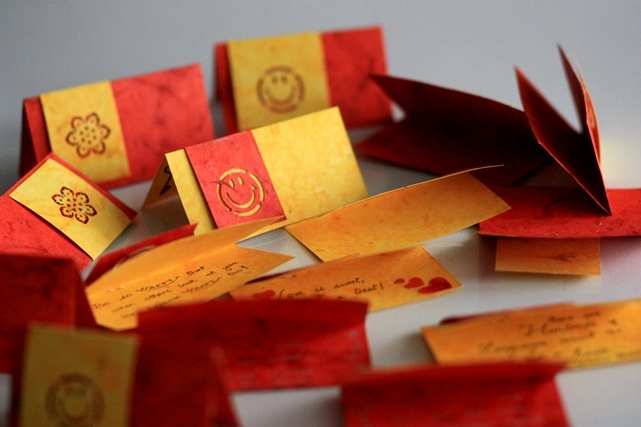 And then slowly the sketches evolved into handmade smile cards, message cards and bookmarks. Sometime back, after a service retreat, I gave them a collective name of art of heart. Art with heart was an activity we did with volunteers and I loved the name so much that I gave it to this little activity of mine. The idea of art with heart is gifts made and gifted with love. A means to connect and reach out to strangers. In some sense it is an extension of letters to strangers. I make these little gifts and leave them for strangers to find them. Most often I do not know who gets them. There are times, I hear a story of how one impacted the receiver and it really adds to my joy of making them. I won’t say that I’m good in craft activities. In fact it started with a chance visit to kids craft shop. My 5 year old was visiting during her summer vacation and I wanted to plan activities for all the days that she was here… I went to craft shop looking for things to fill her days. In that shop I was so enamoured with all the stuff that was available like craft punches, fluorescent pens, foam moulds etc that I came back with a lot for myself. I got some punches, some handmade paper and a silver and golden pen. 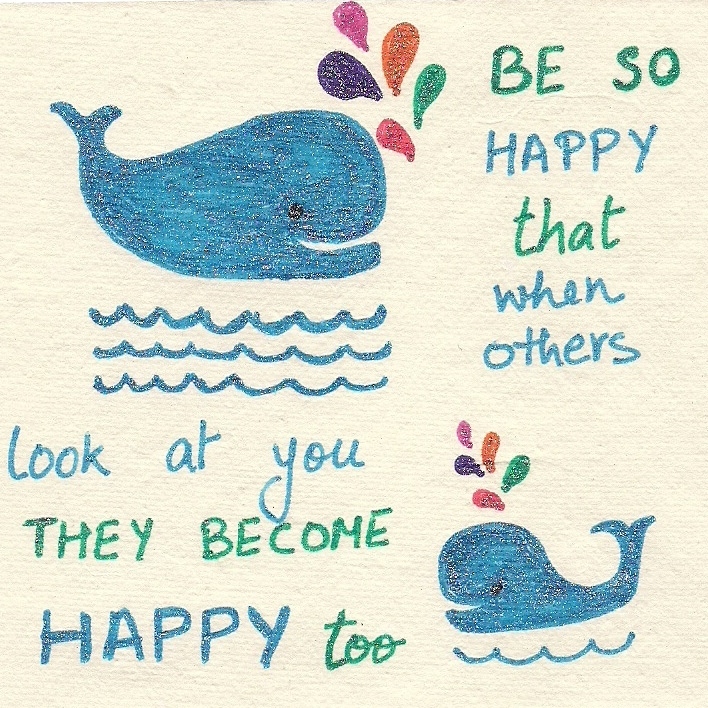 At first it was simple smile cards, with a punched pattern in top and a message inside. And then I modified them a little as I got a feedback that the gold or silver was not so visible.. So I started writing on a white paper and putting in inside. During a visit to ahmedabad, I got a perfect opportunity to gift those punches to another friend. that brought me back to the craft shop.. This time I also picked up some colourful glitter pens. And these pens just added a whole new magic 🙂 I loved them… Till now with just the gold and silver I wasn’t doing any illustrations, just the punched pattern but now with colours, illustrations came alive on paper. 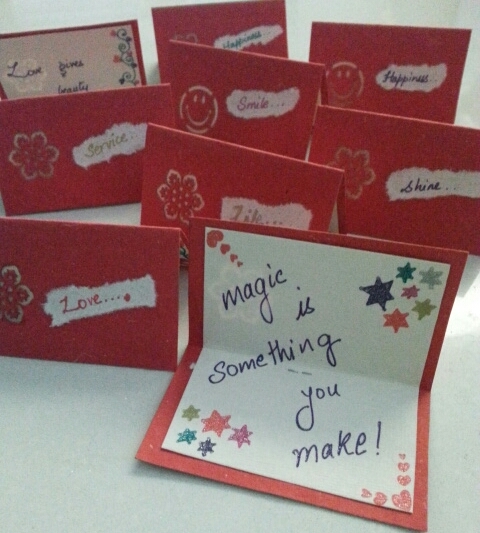 I made a lot of smile cards and message cards and passed them to strangers. Now I carry some empty paper and coloured pens with me all the time and whenever there is a little time I make a card. If I’m lucky I find the opportunity to gift them right away! 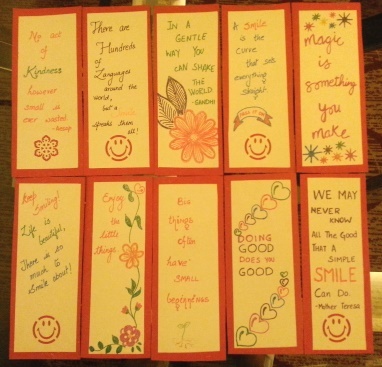 If you want some of these message cards or bookmarks, just send me an email. If I can post them to you I will or else I can send you high resolution scanned images for you to print and use. Every art is a work of heart made with a lot of love just for you. I think it completely sums up the spirit of Art with Heart!